The GB ‘Great Britain’ Cafe and Restuarant is in Sneinton Market and had a striking, brightly covered appearance that certainly stands out as you approach into the market area. It seems to be a slightly more upmarket transport cafe type of place. The menu is essentially as many different ‘All day breakfast’ type dishes as you could possibly dream up, all for just under 5 pounds. It was pretty large inside with a mixed clientele of passers by and guys from the market. I could imagine that it is packed out when the market is busy and setting up. 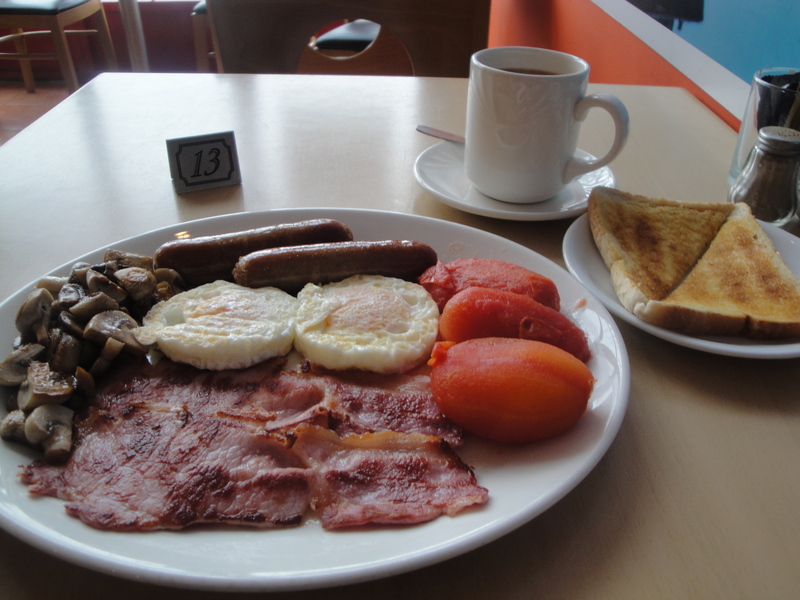 I looked down the list of different ‘all day breakfast’ and to be honest there was not much to choose between them, so I opted for a ‘Brunch Breakfast” which was 2 sausage 2 bacon, 2 eggs, mushrooms and tomatoes. I was given table number 13 and wondered as it was handed to me if this was a good or bad omen? It was a jolly big plateful and I really am kind of torn as to whether this was good or not. I can view it one from one of two angles, as a good replication of a 1980’s British breakfast, fried eggs and bacon, with tinned tomatoes and cheap sausages that conceptually could be seen to be a ‘themed’ GB type breakfast, on that basis it was a great rendition. The other way to approach it from a slightly snobby culinary standpoint would be to say “who still thinks it is OK to serve tinned tomatoes?” and ‘I like sausages with meat in them these days not those really low quality bangers full of water and breadcrumbs’. To be fair there was a good mound of nicely cooked mushrooms, the bacon was crisply fried, and I did like the two fried eggs that had been cooked in ring molds to make them perfectly circular (sad but that makes me smile). The toast was OK it was white bread, no brown option (I would have had white anyway), and the mug of tea was good and strong. I found out why it was strong when I was half way through and found the tea bag still in there. Overall I was happy enough with my plateful, secretly I still like those cheap bangers (dont tell anyone) but I could not bring myself to touch those tinned tomatoes. I really want to know if anyone actually does eat them. I wouldn’t bring any of my American friends here though as this is just the sort of breakfast that they would mock and use as evidence that English food is terrible. Thing is that they just don’t understand, and I have no intention of educating them. This is just how we do it and the fact that these places flourish and survive must mean that there is a market for this type of breakfast. 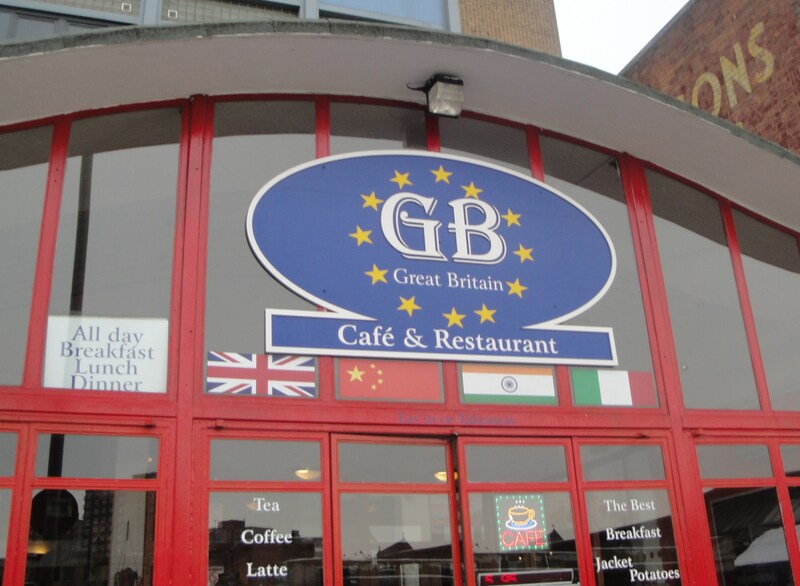 The GB or Great Britain Cafe and Resturant is on Gedling Street in Sneinton Market. Walk down the hill through Hockley to the market from the Lace Market Tram stop, it is just past the bright green fronted Murat store. Previous Post Murat Food Centre – It is big and green and full of ethnic treats. My name is Thierry Chenevat and I am a French national. My friend came to your establishment for breakfast and she thoroughly enjoyed it. She also told me that you were looking for a professional waiter, and I have a lot of experience in the catering industry. I was wondering if you would be interested to meet for a chat regarding this position. My mobile no is 07542 595 696 and my email address is thierrychenevat1@hotmail.co.uk. I also had the Brunch Breakfast and i do like the tinned tomatoes. reason being it adds to the sauce you mop up with the bread at the end. I also thought the sausages were a bit rank. but definitely vfm! !